Check this out. You’re on time, for a change. You slip into your car, turn on the radio to the familiar voice of Colony radio. Your coffee is at your side, you’re all ready to go. You flip the switch and the garage door won’t open. But you don’t have to worry, because you know that at Veteran, we’ll be there for you to provide same day local and emergency service for your garage door repair. We pride ourselves on excellent service and our free service-call: 972-347-0724 includes the entire area of Colony TX. It doesn’t matter where you live, our professional and capable field technicians will be over to fix your faulty garage door. We value all our customers, and especially those in The Colony, TX. 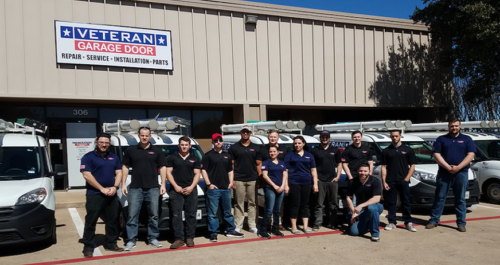 Veteran offers garage door repair service in Colony, TX, for a variety of problems which include replacements for broken springs, loose chain belts, garage door cables, bent tracks and problems with smartphone control. Our field technicians are experts, ready to come out and fix these problems, and more. If your garage door is stuck or not opening properly, before you call us you might want to check out our website first. Click on FAQ and you’ll see a whole range of questions that might help you. There could be any number of things that could go wrong, and we recommend that you call us and we’ll send a technician over to your place, but if you want to fix something simple, like changing the light bulbs, then check out our website. Sometimes we’ve been called out on a service call and the solution was simple, like the batteries for the remote needed replacing or the light bulbs in the garage door, or a garage door opener that needed replacing. We do recommend that you use standard, not LED, light bulbs for garage door openers. You might try Liftmaster or Genie as they claim that they have a LED light bulb which does not emit a signal that interferes with the opener. However, in any case you feel stuck or at a loss, don’t hesitate to call us for any garage door repair service in Colony. Customers in Colony, TX are at the top of our list.